As a child, Joe Molinaro became fascinated with and amused by strange objects, taking things apart, and collecting. “My parents always called me ‘the one with all the hobbies.’” He didn’t focus on art in high school, planning initially to major in special education in college. He changed his mind after a chance encounter with a Notre Dame graduate who described to him how much he had enjoyed pottery classes while in college. Halfway through his junior year at Ball State University, he visited the art department’s ceramics studio and began learning all he could about the equipment and pottery-making techniques while working after hours with students and faculty. He changed majors to pursue an art degree and, after graduating, entered Southern Illinois University at Carbondale’s MFA program to begin work as a ceramic artist. Following graduate school, Molinaro moved his family to England, following another childhood interest—travel—to work at a crafts gallery in London. His first job as an art teacher was in Florida, where he had access to a rich international community of art and culture. While spending Christmas vacation in South America, he visited Ecuador. Some unique pottery he saw in a hardware store there piqued his interest in the pottery-making traditions of the region. 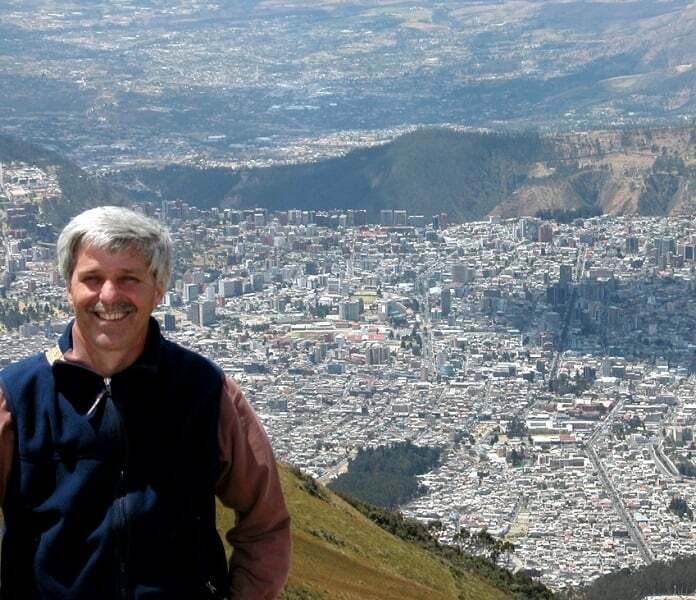 In 1991, he began teaching at Eastern Kentucky University and became a member of the Kentucky/Ecuador Partnership, a program connecting EKU faculty and students with colleges and universities in that South American country. Soon after that, he was offered the chance to exhibit some of his work in Ecuador and received a travel grant to lecture there. Impressed with his lectures, one school requested that he return to Ecuador to teach during the summer. On the weekends, he began exploring the Amazon basin, on the lookout for examples of the region’s traditional pottery. He has returned to Ecuador regularly through Fulbright grants and other academic resources and has used this experience and his own work as an artist to develop a multi-faceted career as a potter, art teacher, travel writer, and cultural enthusiast. Between his teaching and position as Chair of the EKU Ceramics Department, working in his home studio in Winchester, Kentucky, and traveling throughout South America exploring the indigenous cultures and their pottery traditions, Molinaro also enjoys helping those in need, participating in the Empty Bowls project and helping raise money to feed the hungry.